Japan is known for a lot of things. One of these is the Japanese people's enviable discipline when it comes to living their lives. A couple of years ago when a tsunami ravaged swathes of the Japanese coastline, people lined up and patiently waited for their turns in receiving relief goods or when buying from still-standing businesses. The scenes are very different from what we regularly see in other countries wherein everything's a mess and there's always rampant looting. Another great thing about the Japanese people is that they show the same discipline when they are in other countries. A perfect example of this was witnessed by the world when Japanese football fans picked up their trash during the conclusions of matches at the World Cup games in Brazil a few months ago. They didn't leave the stadium until their designated seats were free from litter. Now, a Japanese national in Baguio City is showing the same thing. 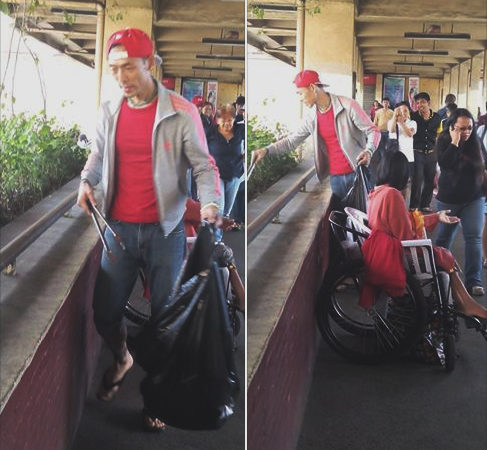 Mazakasu Nose regularly trudges up the stairs of the overpass connecting Maharlika and Tiong San to pick up trash. He always bring along with him a black garbage bag and a tong to pick up litter on the overpass. Photo by Celayca Aviles via Facebook. Baguio resident Celayca Aviles took photos of Nose and posted them online. The photos quickly went viral. And deservedly so. This man deserves a pat on the back for sacrificing his time and resources in trying to help keep the city free from litter.